Terrell Davis was born on the 28th October 1972, in San Diego, California USA, and is best known for being a retired professional American Football player, who played in the position of running back in the National Football League (NFL) for the Denver Broncos. His career was active from 1995 to 2001. Currently, he works as a football analyst, and is also recognized as an actor. Have you ever wondered how rich Terrell Davis is, as of early 2016? According to sources, it has been estimated that the overall size of Davis’ net worth is as high as $10 million, which has been mostly accumulated through his successful involvement in the sports industry. Another source comes from his involvement in the entertainment industry as an actor. He has also increased his fortune with his autobiographical book. 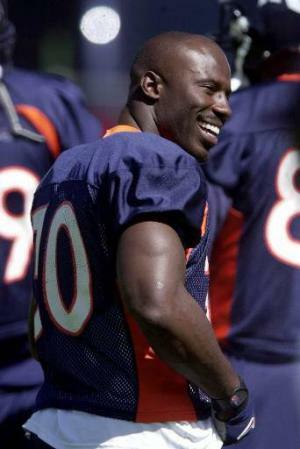 Terrell Davis was raised with seven siblings by a single mother, Wateree Davis, who worked as a nurse. He started playing football while he attended senior year at Lincoln High School. After graduation, Terrell first enrolled at the Long Beach Sate University, where he spend two seasons, playing for the Long Beach State football team, before the team was cancelled due to the lack of funding. After that he transferred to the University of Georgia, where he continued to play football, and became one of the best running backs, however, he was prone to injuries, and because of that his subsequent draft position was much lower than it could have been. He entered the 1995 NFL Draft, and was selected as the 196th overall pick by the Denver Broncos, for which he played until retirement, after the 2001 season end. In his first season, he rushed for 1,117 yards, and had seven rushing touchdowns. With the beginning of the 1996 season, Terrell signed a new contract worth $6.8 million, which certainly increased his net worth. Terrell finished the 1996 season with 1,538 and 13 rushing touchdowns. His best season with the Broncos was the 1998 season, in which he recorded 2,008 rushing yards, and had 21 touchdowns. After the 1998 season, his game performance began to decline, as he suffered several injuries which kept him sidelined for the most part of the seasons, and he decided to retire after the 2001 season ended. To speak of his accomplishments while his career was active, Terrell participated in three Pro-Bowl games, in 1996, 1997, and 1998. He won two Super Bowls with the Broncos, in 1997 and 1998, additionally he was the MVP of the 1997 Super Bowl. Furthermore, he was the three-times AFC rushing leader, from 1996 until 1998, and was the NFL MVP in 1998. Davis was also named into the 1990s All Decade Team. Terrell has also been inducted into the Denver Broncos Ring of Fame, in 2007, and he was inducted into the Colorado Sports Hall of Fame in 2004. Terrell has also appeared in several TV series, including “The Jersey” (2000), and “Sesame Street” among others, which added to his net worth. Furthermore, Terrell served as host for NFL Total Access, and as a color commentator for NFL Network, covering several NFL European games. Regarding his personal life, Terrell Davis has been married to actress/model Tamika Nash since 2009, with whom he has two children. The couple currently lives in Temecula, California. 1 Attended Abraham Lincoln Prep School in San Diego, California. 2 Drafted by the Denver Broncos in the 6th round (196th pick overall) of the 1995 NFL Draft. 3 Attended Long Beach State University where he played for the late George Allen. Later transferred to the University of Georgia where he completed his college career. 4 Ranks 32nd on NFL All-Time Rushing Touchdowns List (60). 5 Ranks 25th on NFL All-Time Rushing Average List (4.596). 6 Ranks 33rd on NFL All-Time Rushing Yardage List (7,607). 7 Ranks 41st on NFL All-Time Rushing Attempts List (1,655). 9 Running Back for Denver Broncos (1995-2001). 10 Denver Broncos All-Time Leading Rusher (7,607 yards). 11 Member of Super Bowl XXXII and XXXIII Champion Denver Broncos teams.